When Yankee Candle contacted me and asked me to create a couple of Autumnal recipe cards to go with their new 'Fall collection' I was so excited! I've been a Yankee Candle lover for years and always get so excited for new scents coming out, so this was a dream collaboration for me. I was asked to create a recipe to compliment the Vibrant Saffron candle and the Mulberry & Fig Delight candle, so I came up with a delicious and warming vegetable curry with saffron rice and sweet Fig & Mulberry tarts. Both recipes are so comforting, so seasonal, full of flavour and easy to make. They're also both gluten free, suitable for vegans and refined sugar free. I'm really proud to have collaborated with Yankee Candle and I'm delighted with the recipes I created, so of course I had to share them on my blog for you too! The fig & mulberry tarts are the best autumnal sweet treat. 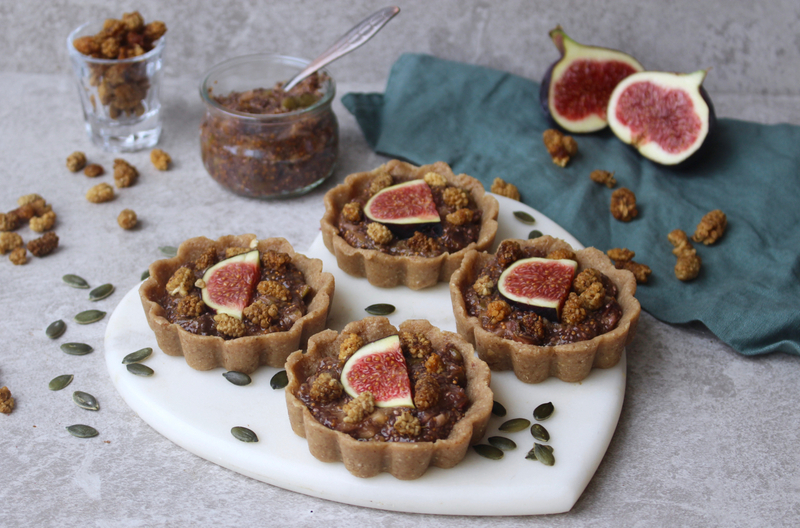 The raw pastry is made of oats, ground almonds, dates and coconut oil - so all natural and all delicious, the fig jam is super easy to make and any leftovers are delicious on toast, the chewy dried mulberries on top add an extra touch of sweetness to the tarts and are full of nutritious goodness! The vegetable curry with saffron rice is going to be your go-to Autumn/Winter meal, trust me. 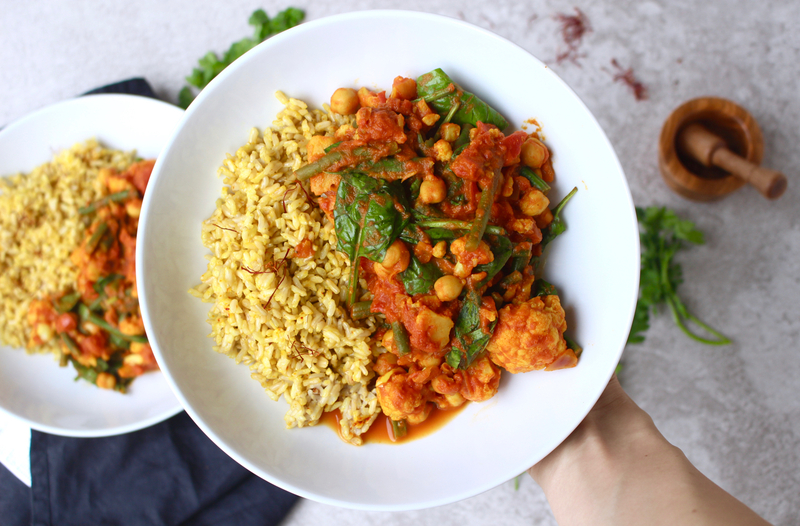 It's full of flavour with incredible spices, it's warm and comforting and it's super easy to make. The saffron rice not only looks pretty but brings something truly special to this meal. The curry can also be batch cooked and frozen! 1. To make the tart bases, add the oats to a food processor and blend into a flour-like consistency. Then add the ground almonds and blend again. 2. Pit the sites and add them to the food processor along with the coconut oil. Blend until a sticky dough like mixture forms. 3. Press the mixture into tart tines (silicon works best but you can also use a cupcake tray). Make sure to mould the mixture up the sides too! Place into the freezer to set. 4. To make the fig jam, slice the figs into small cub pieces and add them to a saucepan over a low-medium heat along with the maple syrup. Cook for 10 minutes, stirring regularly. 5. Once the figs begin to soften, remove from the heat and mash with a potato masher. Then stir in the chia seeds and place back over the heat for a further 8-10 minutes. Remove from the heat and allow to cool. 6. Once the jam has cooled, remove the tart bases from the freezer and from the moulds. Spoon the fig jam into each of the tarts, then top with dried mulberries. Finish with a slice of fresh fig on the top of each tart. 1. To cook the saffron rice, bring a saucepan of water to the boil and add the rice. Reduce to a summer. Take the saffron threads and put them in a spice mortar. Grind the spice with a pestle into a powdery like consistency then add this to the rice as it cooks. Cook for 20-25 minutes. 2. Cut the cauliflower into florets and cut the green beans into thirds. Steam cook for 5-8 minutes to soften a little. 3. Add the olive oil to a saucepan over a medium heat. Dice the onion and add this to a saucepan along with the crushed garlic cloves, allow the onion to brown a little then add the curry powder, ground cumin, ground coriander and ground turmeric. Stir and cook for a couple of minutes then add the chopped tomatoes, coconut milk and tomato puree to the pan. 4. Add this chickpeas to a saucepan, then the cauliflower and green beans. Stir well, cover and cook for 15 minutes over a low heat. 5. After 15 minutes, stir in the spinach until wilted and season with a little salt & pepper. 6. Serve the vegetable curry alongside the saffron rice for a delicious, colourful and nourishing meal. You can buy Yankee Candles 'fall collection' here!